Flying scale RC helicopters might be your long term RC helicopter goal. It certainly was mine when I was first getting into the hobby & still is to this day. To be perfectly honest, if I wasn't trying to cover and understand most aspects of rotary RC aircraft on this website; I would put every cent, every available minute, and every resource into scale. Scale RC helis are my true passion & love in this hobby. If I was forced to give up every type heli I own/fly right now except one, the big scale birds would stay and the rest would go. That says a lot since I enjoy all of them! Video below shows one of my scale heli builds. Many of the interior details I had to hand build myself and it was such an enjoyable & relaxing process - modeling fun at its best! First we have the 3D world demanding higher and higher power, lightning fast reacting collective pitch RC helicopters which are not well suited for scale type flying. Next we have the "Drone Noise" that is taking much of the focus & skill away from true RC helicopters (scale, sport, & 3D). Combine the two, and scale seems to be way out in left field. No matter, if scale is your interest, GREAT; but you still must learn and become a proficient RC heli pilot on a Pod & Boom helicopter first. 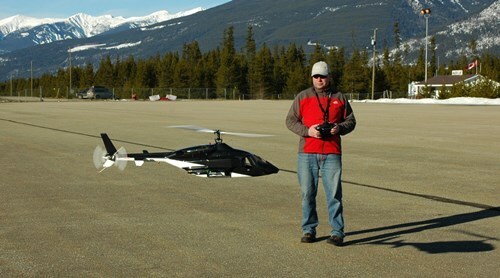 What’s the difference between scale RC helis and pod & boom? The majority of scale RC helis are fitted (covered or skinned as I like to say) with a fuselage to resemble many different types of real life, full size helicopters. Pod and boom helicopters on the other hand are exactly that – a “POD” up front that encapsulates most of the helicopter mechanical systems. Exiting the back end of the pod is a long aluminum or carbon fiber tube called the “BOOM”. The tail rotor is then attached at the end of the boom. Pod and Boom RC helicopter design is by far the most common type and best RC helicopter choice when you are first starting out in the hobby. In fact, they are pretty much the only RC helicopter choice because most scale RC helicopters are generally nothing more than Pod & Boom mechanics covered by a scale fuselage. Scale Bell 222 Ready For First Test Flights. Not Completely Finished Just In Case Something Goes Horribly Wrong! Why Start Out With Pod & Boom? 1. Simplicity is key when you are starting out. Fitting a scale fuselage over pod and boom mechanics is generally not easy and adds considerable complications and time to the build process. You will also be making many adjustments (static and dynamic) to your helicopter at first after it is built and during the first few flights. These adjustments are much easier when you can see and get to everything on a Pod & Boom heli. A scale fuselage usually makes these adjustments more difficult. As you can see from the above picture, stuffing your pod and boom mechanics into a fuselage limits the access to many components. Fitting the mechanics into the fuselage is generally not an easy task - there is lots of trial fitting, perhaps some trimming, usually some customization involved, and most definitely some cursing and head scratching. I would never put brand new mechanics into a fuselage either. There are just to many unknowns with a fresh build from mechanical adjustments to FBL system programming. Only after several successful test flights of the mechanics in Pod & Boom configuration do I feel safe to fit them into a fuselage. Here's a video I made showing a fairly typical scale RC helicopter mechanics install to give you a better idea of what's involved. 2. Fragile at Higher Costs. Larger scale fuselages are not cheap. A good quality pre-finished fiberglass fuselage can cost as much or more than the pod and boom helicopter kit you are putting into it. Whenever you fit a scale fuselage (from micro to monster), you increase the cost & weight; but the most import aspect of scale to realize is scale detail is fragile. The more detailed, the more fragile it gets. This is also true of the less expensive RTF micro scale RC helicopters on the market. You really must be a proficient RC helicopter flier before even considering scale - honestly! Even a slightly hard landing that a Pod & Boom would survive will damage most scale RC helicopters. Most body shells are not designed to take impact forces. The landing struts or in some cases retractable gear are generally not as strong as beefy and springy pod & boom landing struts. The horizontal & vertical tail fins are not as strong, and the overall weight is up releasing more impact energy when things do go wrong. 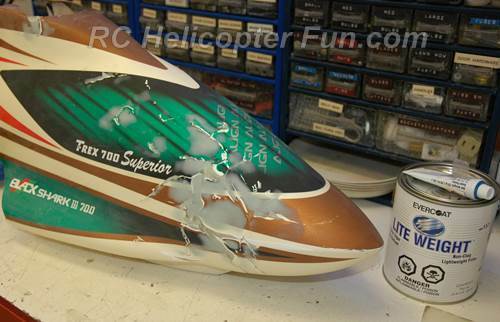 Crashing a scale RC helicopter while learning would be very disheartening to say the least. A fuselage is pretty much a mangled pile of garbage even after a small crash. Light Crash - Major Damage! 3. You have to get a Pod and Boom heli regardless. Remember, you generally get the fuselage separate and fit it over your pod and boom mechanics. There are a few exceptions to this offered by a few manufacturers that have "Super Scale" kits. These special and more advanced scale RC helicopter kits come with special helicopter mechanics that are specifically sized and engineered to fit into their specific fuselages. I discuss super scale in more detail on the bottom 1/3rd of this page and why they are not the best choice for your first steps into scale helicopter flying. Note, these points apply to larger collective pitch scale RC helicopters, not the small or micro size inexpensive ones you can find at places like Amazon. The point about fragile scale details however holds true for all sizes. This is of course subjective, but in my opinion, one of the best pre-finished (meaning all painted) fuselages are manufactured by Fun Key Manufacturing (link takes you to my review on them). Century Helicopter Products is the Fun Key fuselage distributor in North America and many people think Century Helicopter make these fuselages; but if you look at the name decal inside, they are in fact FunKey. 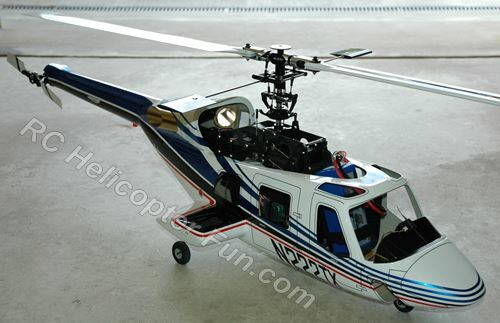 FunKey Manufacturing makes popular helicopter bodies to fit 550/30, 600/50, and 700/90 size RC Helicopter Mechanics. I am amazed each time I first set eyes on a new FunKey fuselage when I order one. They seem to keep improving the quality with even more attention to detail. The fiberglass layup work is outstanding and the paint job is true automotive quality! Most of their bodies also have carbon fiber reinforcements in the high stress areas of the fuselage adding to the overall quality and strength. Here we have a typical scale FunKey fuselage right out of the box. This 600/50 size Bell 222 scale RC helicopter fuselage will be my fourth FunKey fuse and as I just mentioned, they make some of the nicest pre-finished bodies in the biz. I am just doing a final sizing here to make 100% sure the pod & boom mechanics from an Align Trex 600ESP helicopter will fit and all the important measurements all line up. These Trex 600ESP mechanics have seen many test flights and I feel 100% confident that they will offer the bullet proof reliability I need for this scale RC helicopter project. 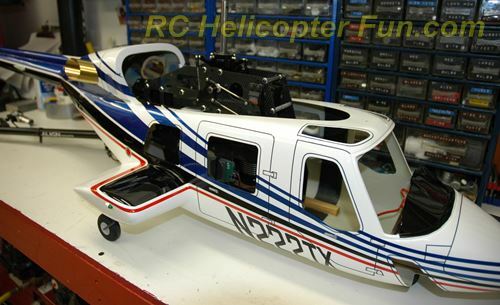 If a scale RC helicopter is your goal and with that last point in mind when deciding on your best RC helicopter kit; make sure the kit you get will support the fuselage you want or vise-versa. If you have a set of T-Rex mechanics for example and you like the Bell Jet Ranger, you can't just assume every Jet Ranger fuselage out there will fit it. That is another thing I really like with FunKey's fuselages. They have a very good measurement schematics on every model they make taking most of the guess work out of it so you know your pod and boom mechanics should fit in the specific fuse you are considering. Above is a typical FunKey Sizing Schematic/Chart. With these few yet very critical dimensions listed, you can pretty much be 99% sure that your specific set of pod & boom mechanics will fit. Polystyrene is only used on mini RC toy helicopters. It's very inexpensive and light weight, but serves as a very good protective shell for these little toy helis. Unlike the scale RC airplane world where "foamies" have taken over; it's very doubtful we will ever see "foamie fuselages" for our scale RC helicopters. Polycarbonate is light and inexpensive. It is used mostly on micro to small size scale RC helicopter bodies. Cold weather makes polycarbonate very brittle; something you should consider if you fly outside in winter. Fiberglass is heavier and more expensive but stronger than polycarbonate. It's the by far the most popular and best RC helicopter material for larger helicopter canopies and fuselages from a price in relation to strength/weight/longevity ratio. Fiberglass handles the cold and vibrations better than polycarbonate. It also is fairly easy to make “good as new” repairs to fiberglass if it has suffered from light damage. Fiberglass auto body repair materials work very well for this. Carbon Fiber is stronger and lighter than fiberglass, but because of its expense, is not used much as a pod cover or fuselage material (other than high stress area reinforcements). There are some high end kits that use carbon fiber for the pod cover and a few high end fuselages (Vario Helicopters has a big full carbon fiber Airwolf fuselage for example). I'm very happy with my fiberglass FunKey bodies. 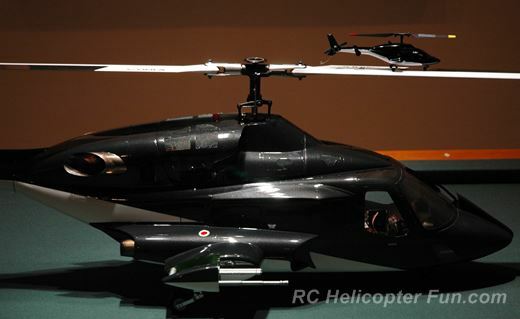 How To Determine Scale RC Helicopter Ratio To Full Size? I actually just got this question and figured I should address it. You could have two different 600 size fuselages be totally different scale ratios to their full size counterparts. For example, a 600 size MD500 is going to be a larger scale than a 600 size Bell 222 because the full size MD500 is a smaller helicopter than the full size Bell 222. In fact, even though the two scale RC helicopters are roughly the same size using 600 mechanics, the scales can be substantially different. 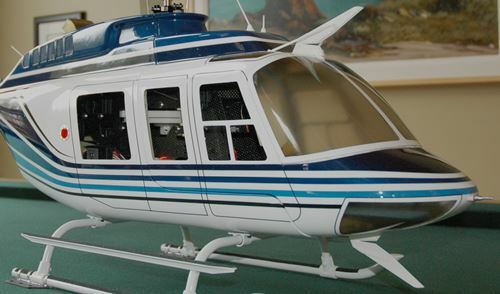 For instance, a 600 size Bell 222 is about 1:11.5 scale, but the 600 size MD530 is about 1:6.5 scale. To find the actual scale of any particular scale fuselage you are looking at, you simply get the overall dimensions of it, and then compare them to the overall dimensions of the full size machine to get the final scale. 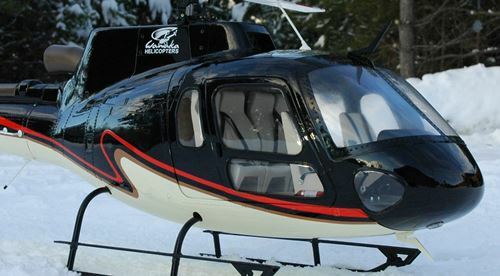 For example, the FunKey 600 size Bell 222 fuselage is 1330mm long. The full size Bell 222 is about 50' long (15240mm); so the 600 size FunKey fuselage works out to a scale of about 1:11.5 (15240mm/1330mm). On the other hand, the full size MD500 is about 25' long (7620mm), and the FunKey 600 size MD500 is 1180mm long so the scale works out to about 7620mm/1180mm = 1:6.5. As you can see, the 600 size scale MD500 is almost twice the scale size as the 600 Bell 222. So, what 600 size FunKey fuselage is roughly a 1:9 scale? The one that comes closest is the Agusta 109A. The full size Agusta 109A is about 37' long (11278mm), and the 600 size FunKey 109A fuselage is 1320mm long giving a scale ratio of approximately 1:8.5. By the way, to find the dimensions of full size helicopters, simply do a Google search for "dimensions of whatever helicopter" you want to know. Look at few different pages since there might be an error but if several pages all state the same or roughly same dimensions, you know it's a safe bet that is the actual size. I find length (nose to tail) is generally the best dimension to use in the calculation as it's the longest and therefore will give the best overall scale resolution between full size and the model. All of the scale RC helicopters pictured above are classified as "Semi Scale". This simply means they don't have the same level of detail & full scale interiors that "Super/Full Scale" helis have. Semi scale also generally don't have working/opening doors which most super/full scale fuselages have. 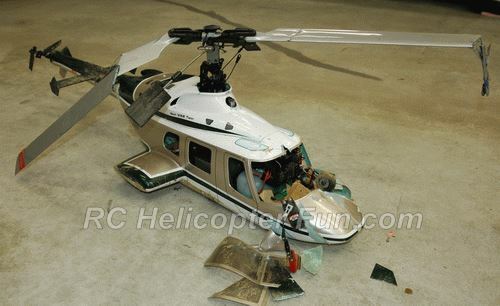 The first thing you will notice is you can see all the mechanics inside this semi scale heli. This is the main distinction between semi scale & super scale. There are other exterior details that super scale generally have that semi scale don't such as cable cutters, step plates & bars, bear's paws, antennas, pitot tubes, rivet detail, etc. That however can all be added onto semi scale just as I have done on this Bell 206 Long Ranger. 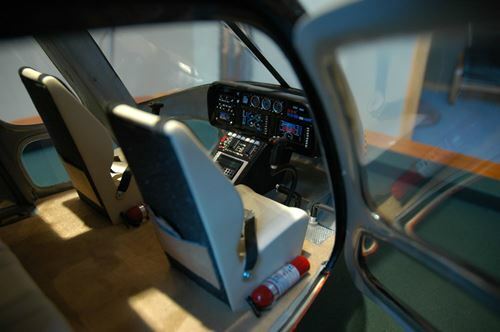 In comparison on this super scale RC heli, you'll notice it has a full scale interior and all the mechanics are hidden. This is achieved by using customized mechanics that are purpose designed for the particular scale body they are being installed in. In other words, they are not simple pod & boom mechanics that you just install a fuse over. Semi scale is by far the best way to introduce yourself to scale RC helicopters since it costs substantially less (both for the kit and taking into account you likely already have the pod & boom helicopter mechanics), takes less time to build, and is not nearly as finicky. Not to mention, not nearly as depressing if you happen to crash. Once you have mastered semi-scale however, super scale is the next rewarding and fun step. As I mentioned below the video on the top of the page, making all the little scale details for inside the cockpit such as the fire extinguishers, seat belts, collective sticks, tail pedals and even dressing up what was included by adding more detail was so rewarding & relaxing. I know not everyone likes making little details like that, but if you do, you'd likely really enjoy super scale. There are not many super scale RC helicopter manufacturers out there, but the two most common are Vario Helicopters & Roban Models. Vario is the higher end of the two, but you pay big coin for that quality. Roban on the other hand is more affordable, but the quality is not as good; in fact, FunKey's fiberglass and paint quality is better than Roban's. That black AS350 I have by the way is a Roban model, and for me, I find it more than adequate; especially if you take the time to go through the mechanics with a fine tooth comb to sort out possible issues & improve on the interior details. For more information on this model, here is my full review on it. What on earth is that ugly thing you ask?! Well, this holds just as true for super scale. Since super scale mechanics are customized for particular fuselages and can only be flown once installed in the fuse, some folks will install them and hope for the best - NOT ME! I have been involved in this hobby way too long to take anything as complex as a fresh CP build for granted. It took perhaps an extra hour at most to build that prehistoric looking test platform out of some 2x4 and 1x4 lumber along with an old set of landing skids/struts I had lying around, and then fit the super scale mechanics onto it. I then flight tested, flight tested, and you guessed it - flight tested some more.